I’m referring how to copy an iPad – with a copier…“WTF??!! !” might be the first words entering your brain . I had similar thoughts when I heard about this idea. From my mum. MUM: I read an interesting article in the newspaper on the iPad. So I decided to share it. 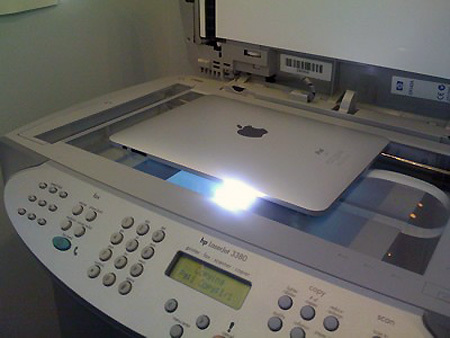 MUM: I put the iPad on the copy machine and copied it. I then shared the copied paper with my colleague…. I was first dumbfounded. Flabbergasted. Speechless. What on earth…..? But is it really stupid? Or brilliant? After I stopped laughing I explained my mum how to do a screenshot on the iPad. Press the home button and the sleep/power button at the same time. Retrieve the image from your camera roll and upload it to ownCloud or just send it via email. But then I realized that she was at work. Her iPad isn’t connected to the WiFi at work (I doubt there is even a WiFi) and she doesn’t have a 3G connection on the iPad. So actually, she can’t share the article electronically. If she really just wants to pass it to a colleague, she will have to hand over her iPad. Or type it. Or just copy it with a copier. “But”, you might say, “you can’t copy from a screen, that’s impossible”. That’s what I thought as well. But I was proven wrong. It worked. And as it was only printed text, the quality was good enough to read it. So looking back I have to admit: Good job mum! Brilliant idea! I’m proud of you!